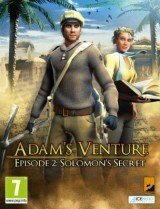 We have 2923 adventure games in our database (excluding freeware titles). 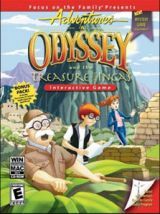 If you're looking for a specific game, try using our adventure game search page. You're currently on page 5 (of 244). During excavations in an old Templar church in Luz, France, Adam Venture finds a scroll that seems to provide the exact locations of the 4 rivers described in Genesis. 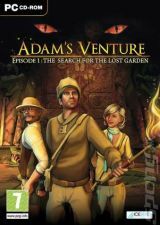 In this second installment of the episodic series, Adam Venture and his crew end up in 1920s Jerusalem after having escaped alive from the Caverns of Eden. 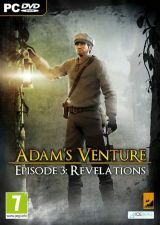 In the third and final Adam's Venture installment, players go back in time to see how Adam and Evelyn met, then continue their present day story, discovering what happens after they are split up and Adam is left for dead by the goons of the Clairvaux Corporation. In the distant future, colonists on the planet Tranquility built settlements like idealized versions of Earth cities from the centuries before space exploration, where they lived peacefully until suffering a catastrophic environmental disaster, necessitating its forced evacuation. 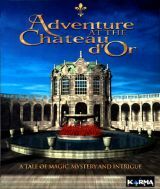 The princess heir has chosen you as her hero and you lead the quest to unlock the secret of the fabulous Chateau d’Or. You must do battle against an evil wizard in order to save the life of the princess. With a newly acquired book of Ice Magic, the villainous Ice King has frozen three princesses. 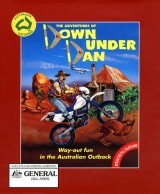 This was the earliest text adventure widely available for microcomputers and likely the first adventure game to be commercially released. Bertram Fiddle, the World’s Leading Victorian Explorator, has been finding it difficult recently to find any lost worlds and it seems that most unbelievable discoveries have, unbelievably, been discovered. Bertram has been forced to take a job at Dulsworth’s Soap Factory but soon finds himself embroiled in mystery and is framed for a murder he did not commit. Dan is a bush pilot with an urgent need for cash—about all he owns of his plane is the air in the tires! Just before the bank decides to repossess his craft, a friend tells him of rumoured fortunes being made.